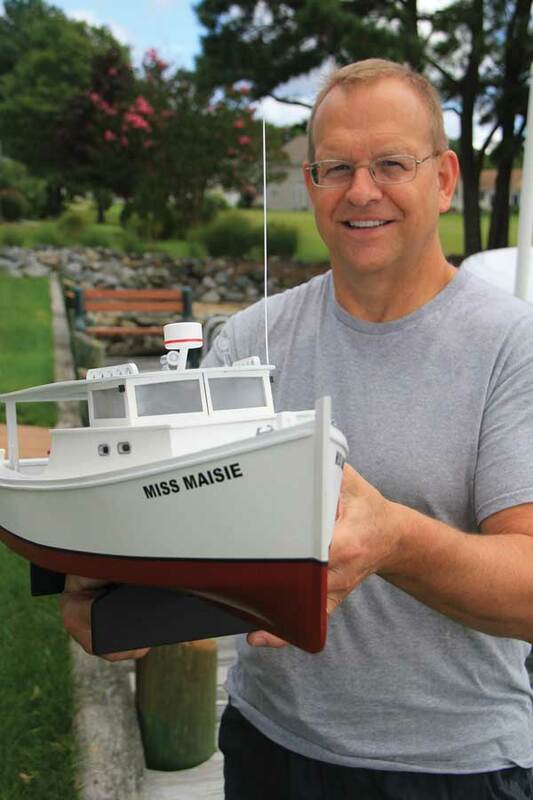 The Chesapeake Bay model workboat building business was just what the doctor ordered for this type-A Eastern Shore entrepreneur. Blackway hoped to establish a line of boats collectors would value that epitomized the Bay workboat genre. You can’t slow Bruce Blackway down. While recuperating from his second cardiac event at an Eastern Shore hospital, the 64-year-old self-proclaimed workaholic couldn’t stop peppering his waterman roommate with questions about deadrise boats and life on the water, as he had just started his own model workboat building business. Blackway started his Chesapeake Bay wooden model workboat business a little over two years ago. The idea was to establish a line of boats collectors would value that epitomized the Bay workboat genre. His original intent was to have a “soft opening” in preparation for his retirement in a couple of years. Like most things Blackway starts, however, the “soft opening” soon turned into an all-consuming passion to design and source the most authentic line of wooden workboat models available anywhere. Boxes of finished boats, accessory parts, and shipping materials cram every available space in Blackway’s house on Manklin Creek just a stone’s throw from Ocean City. Jill, his wife of 40 years, rolls her eyes when Bruce comes up with a new idea for the business. “It’s a good thing these boats are 1/12 scale. If they were any bigger, we’d need a bigger house!” she says. Presently, Blackway’s model boat line-up includes 12 classic Chesapeake Bay workboats, ranging from buy boats and oyster and crab boats to skipjacks and a draketail workboat. He even sells a line of skiffs complete with classic Johnson or Evinrude outboards. 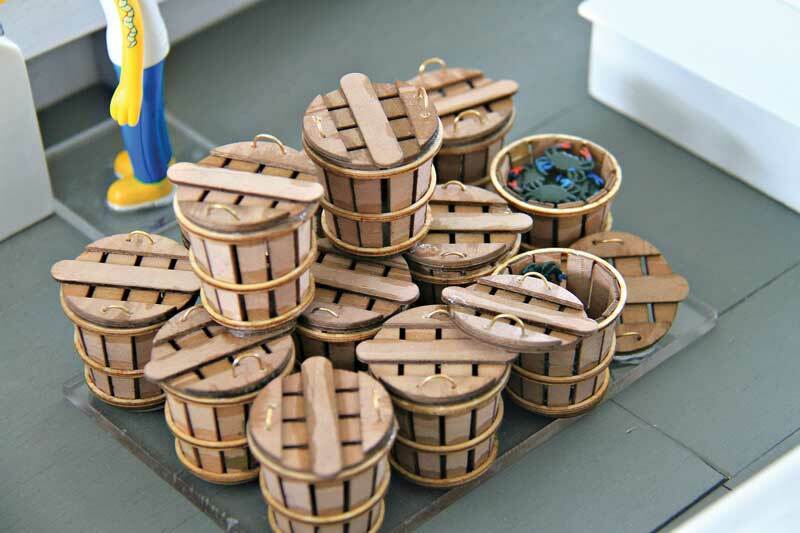 The workboat models can be accessorized with miniature crab baskets, crab traps, nets, and boat hooks. Depending on the degree of customization the buyer wants, prices range from just under $500 to over $1000. The skiffs go for $155. Mahogany display cases run around $320. The detail is amazing. Some even sport authentic cabins and crabbing and/or oystering gear. You can even have the name and registration customized to your liking. LED lighting is extra! Blackway’s most popular model is the hard-top workboat, which retails for $495. This can be accessorized with miniature crab baskets, crabs (male and female), crab traps, nets, and boat hooks. A miniature bushel basket filled with crabs costs $13, while a miniature boat hook sells for $8. It’s Blackway’s attention to detail that makes his boats special. Before he contracted with both domestic and international wooden model-boat builders to construct his lineup, he prowled the docks and boatyards of the Eastern Shore taking hundreds of photographs of the boats which he anticipated modeling. These photos were translated into a complex set of drawings which his contractors adhered to in their initial build. Blackway figures each unique design takes about two to 300 hours of design work to get right. One of his most reliable suppliers lives just down the road in Salisbury, MD. “He can turn around a new build in a couple of weeks,” Blackway says. Models from overseas take longer. Blackway grew up on the Bay, spending countless hours gunkholing on the 28-foot deadrise his father had customized as a family cabin cruiser. 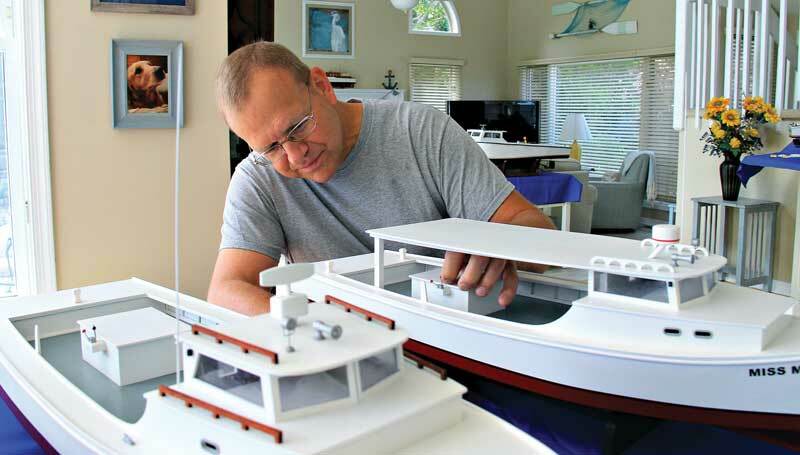 When he discovered a Florida model maker who would turn some old photographs of the B’sHive into a 32-inch model, he was intrigued enough to put a business plan together that would result in him being able to offer a full line of authentic scale models of Chesapeake Bay workboats. The model workboat business was just what the doctor ordered for this type-A Eastern Shore entrepreneur. Blackway doesn’t figure to get rich selling his model boats. If he can sell 100 or so a year, that would keep him busy, and the business could be judged a success. “If I got paid by the hour, I probably would be making less than $5 for a 10-hour day’s work,” he laughs. If you’re interested in an authentic model of a Chesapeake Bay workboat, check out Blackway’s website blackwayboatmodels.com or call (215) 290-3722. Just be sure you have a fresh cup of coffee and are sitting in a comfy chair. Once you get Blackway talking about his model workboats, there’s no telling how long he’ll go. For another story on model boats, check out Remote Controlled Model Boating Clubs on the Chesapeake.